Yoga can improve your total-body strength, concentration and flexibility. There’s a saying that you can fix any ailment with yoga. Actually, it’s not that far from the truth, according to Dr Vyankatesh Satyanarayan Reddy of Dr Venky’s Shivshakti Yoga Institute (drvenkysyoga.com), which provides training and certification for yoga instructors. It’s not too late to join the yoga craze as yet another new form hits town. Practised by everyone from loincloth-garbed ascetics to spandex-wearing professionals, yoga has come a long way. Along this journey it has morphed into various forms, of which hot yoga is one of the most popular. But now, there’s a new stretchy kid on the block – AcroYoga, which has recently found its way to Singapore. 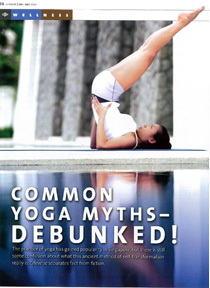 Common Yoga Myths – Debunked! The practice of yoga has gained popularity in Singapore, but there is still some confusion about what this ancient method of self-transformation really is. Lifewise separates fact from fiction. 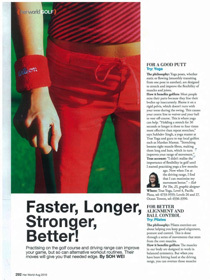 FOR A GOOD PUTT Try: Yoga The philosophy: Yoga poses, whether static or flowing (smoothly transiting from one pose to another), are designed to stretch and improve the flexibility of muscles and joints. WHILE a satsang might sound new-fangled, it is just a typical yoga session - almost. The room is darkened, music might be playing softly and students are gathered round an instructor, but here is the difference: They are talking and in deep discussion, not quietly focused on their postures. With encouraging attendance at sessions like the satsang, a discussion on all things yoga, and the kirtan, a musical meditation session, yoga practitioners here are moving beyond physical yoga practice. 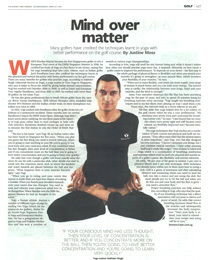 WHEN Mardan Mamat became the first Singaporean golfer to win a European Tour event at the OSIM Singapore Masters in 2006, he credited his study of yoga as a key factor in his victory, saying that his yoga breathing kept him calm. Others, such as Indian golfer Jyoti Randhawa have also credited the techniques learnt in this physical and mental discipline with better performance on the golf course. There are many benefits for golfers who practise yoga, according to Sukhdev Singh (otherwise known as Yogi), a yoga master at True Yoga in Singapore, who says it helps to focus the mind by giving better mental concentration. Yogi has worked with Mardan (2004 to 2009) as well as Asian and European Tour regular Randhawa, and from 2002 to 2005, he worked with more than 50 golfers on the Asian Tour. Wearing a fitted tee that shows off bulging muscles and a bandanna around his head, Sri Srinivas Suresh Kamal's physique resembles that of a fitness instructor rather than a traditional Indian yogi. He is entirely comfortable with his image as it opens doors that might otherwise remain closed to yoga. It also fits in with his intention to promote the ancient Indian form of exercise as a discipline that not only stretches the body hut also builds strength. Master Kemal, as he is popularly known, was born in India and introduced to yoga school at the age of five by his doctor father who was interested in inculcating in him the art of living rather than just the need to produce excellent academic results. He went on to he initiated by his spiritual master Swami Veda Bharat and is well-schooled in various forms of yoga_ A fitness enthusiast, he has trained in gymnastics and karate as well. What True Yoga offers is luxurious facilities on top of their classes. Besides steam rooms and showers, there’s also a members relaxation lounge and a juice bar for you to indulge in a truly calming experience. True Yoga also offers an extensive range of yoga styles so finding one that meets your needs will be effortless.